Construction has begun on a mixed-use development called Rock Row that straddles the Portland-Westbrook line off Larrabee Road and Brighton Avenue. The plan includes an outdoor amphitheater that, if approved, could be the venue for concerts now held at Maine State Pier in Portland. 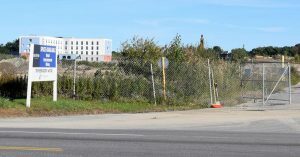 Construction has begun on a mixed-use development on Brighton Avenue in Westbrook called Rock Row. The project will include an outdoor ampitheater that, if approved, could be the venue for concerts now held at Maine State Pier in Portland.